Well, we're at a new house and just finished planting a lot of plants (mainly natives) to attract birds and butterflies. 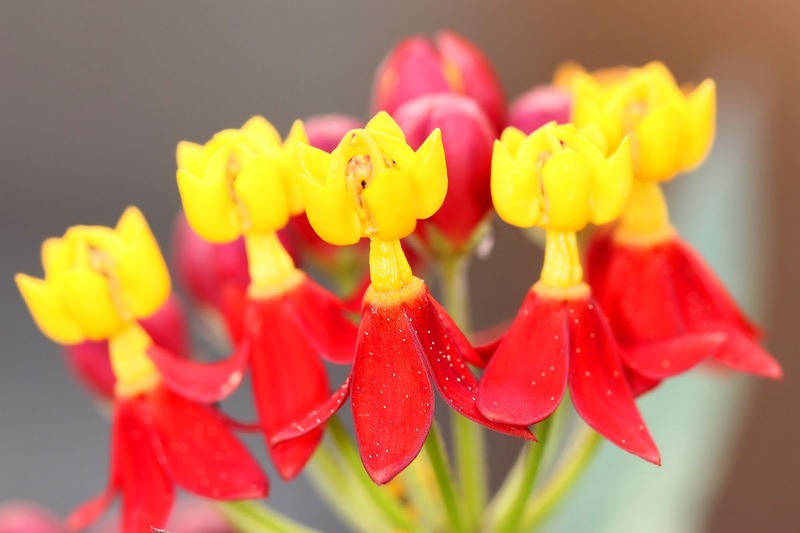 One of our favorites is the Mexican Bloodflower in the milkweed family. In Arizona, these were magnets for Queen butterflies and their caterpillars. My posts on the subject have been some of the most popular of this site. Anyway, the milkweed family also (and more famously) attracts Monarchs. So, I've been checking frequently to see if any migrating monarchs have stopped to lay eggs. So far, none have been seen, but I was surprised to see a mass of little yellow "eggs" on the stems. Yes, these tiny bugs did have legs. And upon researching, they are Oleander Aphids, Aphis nerii, found only on Oleanders and Milkweeds. They are believed to be introduced from the Mediterranean region, and have spread across much of North America. They can occur in huge numbers, though from what I've read, are not a danger to the health of the plant. They can produce a 'honeydew' substance that can look bad, but it seems most gardeners let the aphids take their course. Often, predators or parasites (such as parasitic wasps) will wipe them out in short order. 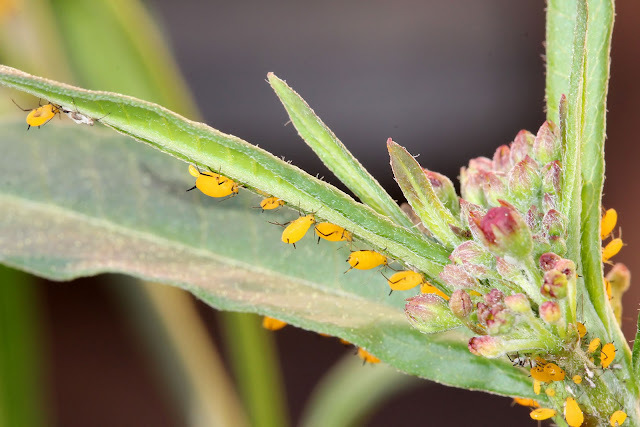 Note, however, that the list of predators is small for the same reasons why Monarchs have few predators - the aphids are pick up toxic chemicals from the milkweed! It's great to find this post. This knowledge is new to me. Now, I know what is a Mexican Bloodflower. A beautiful flower like this is really not obvious that it possesses toxic substances.